In Activity 1 of this lesson, students learned about the important concept of context as it relates to traditional arts and folklife in Nebraska. In this activity they will learn about the folk process, which is how folklorists describe the way folk traditions are created and perpetuated. Name and discuss five basic ways that folk traditions are passed to others. 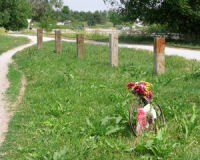 Research and prepare instructions on teaching a new or old Nebraska folk tradition. People are the creators and preservers of folk traditions. Therefore, people determine whether a particular type of art or other expression enters folk tradition. People also determine if that tradition continues over time or dies out somewhere along the line. If stories, songs, proverbs or jokes are meaningful, relevant, or appealing enough that people want to tell or sing them over and over again for a very long time, they eventually become folktales, folksongs or folk sayings. That meaning, relevance or appeal has to continue in order for any folk art or folk tradition to remain alive. Usually, people gradually make changes in traditions to fit changes in their needs and this keeps the traditions alive and relevant. Sometimes, however, a traditional art or other cultural tradition disappears completely. This happens when there is no one left alive who remembers how to do it. These changes are part of a natural process. New folk arts and folk traditions are born all the time as others fade away. The miracle is that some folk arts and traditions continue to circulate for hundreds of years, are found in numerous variations, and even travel long distances around the world. Rituals - The Japanese tea ceremony is one of the most famous traditions associated with Japanese culture and it exists in a number of variations. This ritual of artfully preparing and serving tea has been an important part of Japanese culture for more than 600 years. Masters of this traditional art are highly respected in Japan and among Japanese Americans. Material Culture - In this country, some Native American pottery, basketmaking, and wood carving traditions can be traced to prehistoric times. These basic traditions have remained the same, although specific designs, materials, and methods tend to change slowly over the years as the artists add their own creative touches to the tradition or as some materials traditionally used in the art become hard to find. In this way, folk traditions can be both very old and new at the same time. Oral Traditions/Folk Tales - Folk traditions also can travel widely between different cultures. 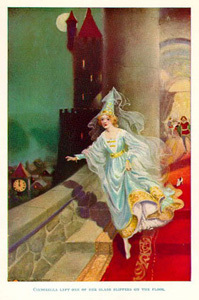 The story of Cinderella is one of the oldest and most widespread traditional folk tales. Versions have been found on all continents and in most world cultures. More than 500 versions have been documented in Europe alone. Scholars speculate that the tale might have originated either in Egypt or in China. In either case, the story is thought to be at least 800 years old. Traditional Music - English language ballads (songs that tell a story) are one of the most well-researched of all folk traditions. Many of these folk songs from the British Isles are known to be more than 500 years old and can be found in countless versions in Britain, Australia, Canada, the U.S., and other English-speaking nations. Comparable groups of folk songs and folk melodies exist in most languages and most countries of the world. Some types of traditional music, such as that of Australian aboriginal tribes, are thousands of years old. They are among the world's most ancient living arts. For cultural traditions to survive so long and travel so far, they have to be transmitted. People who know the tradition (often called "tradition bearers" by folklorists) need to teach or demonstrate the tradition to others. Then, those who have learned the tradition pass it on to yet more people. Often, this is not a conscious process of teaching and learning. Indeed, sometimes people just seem to absorb traditions from long association with tradition bearers or just by living in the same close-knit community with them. Listening to spoken instructions - Rules of a traditional game, such as "Red Rover," are often explained verbally. Observation - When learning to make quilts, traditional learners often closely watch the processes of cutting and piecing the material and using a quilting needle for a while before trying the techniques themselves. Likewise, traditional musicians often spend a considerable amount of time listening to and watching others play. Imitation - Prospective young members of Native American drum groups often start first by observing. Then, they continue the learning process by imitating the drum beats and singing of elders. Example - Many traditional customs, such as traditional greetings, wedding and funeral rituals, and cultural ways of showing respect, are learned by being around elders whose actions serve as examples and by being immersed in a culture over a period of time. Formal or informal apprenticeships - Traditional healers often take on apprentices who learn what the healer knows by helping him or her treat persons who are ill. Although some traditional artists and tradition bearers have learned a part of what they know from books, recordings, classes, or other formal means of instruction, the primary means of transmitting folk traditions is still directly from one person to another. In earlier activities, we have examined many of the older folk traditions in Nebraska, including Native American song, dance, and material culture. We've also taken a look at traditions brought to our state by pioneer-era and newer immigrant cultures, such as saddlemaking, many kinds of traditional music, quilting, Mexican folklorico dancing, water witching, and whittling. However, traditions start at some point in time and not all traditions are hundreds of years old. Because technology, including the telephone, and especially the Internet, has changed the nature of person to person communications, some folklorists include traditions transmitted by these modern means in their definition of folklore, as well. These scholars categorize Internet-circulated jokes, hoaxes, and urban legends as cyberlore, for example. 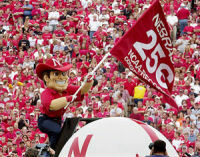 In addition to cyberlore, some other more recently developed practices that Nebraskans might have in common are wearing red on days when the Nebraska Cornhuskers play football, tying yellow ribbons around trees in support of family members serving in the military overseas, and putting flowers and/or religious symbols along a roadway as a memorial to someone killed in a traffic accident. Folklorists study these newer practices, too. They're called emerging traditions, which means they are newer folk practices that are just arising. They might be specific to a particular geographic region or to a certain folk group. Engage the class in a discussion about the ways people learn folk traditions by sharing a story about how you learned a traditional recipe, craft, or game. Alternatively, you can play one of the audio excerpts included with this curriculum, in which a traditional artist explains how she or he learned a traditional art. (See Materials and Resources for suggestions.) Ask students to talk about some traditions they have learned and the way they learned them. Folk traditions can be as simple as how to make a paper airplane, how to play jacks, or how to arrange a place setting for dinner. Note on the blackboard the different ways they learned these things, and add the other ways of traditional learning from the list in this lesson, if they are not brought up in the discussion. Ask students to guess what some of the oldest folk traditions in the world are. (Good answers are Native American pottery making, European folk tales, African drumming, etc.) Share some of the other older traditions listed in the lesson. Direct students to choose either an older or newer tradition that is (or was) practiced in Nebraska. Students are to research their chosen tradition using Internet, library, and local resources. Direct them to look especially for the ways people learn (or learned) this tradition. Then, ask them to write down or draw a diagram of the ways they would teach some technique or other small aspect of this tradition to other students. Remind them to use at least one of the traditional ways discussed in class. If time permits, choose a few students to teach their traditions in class. If time permits, each student could teach a simple traditional craft or performance folk art technique to the class. Alternatively, this could be done by small groups, each working together on one teaching project. Students could ask resource people from the community to teach their chosen craft or performance technique. They should be sure to use at least one, and preferably more than one, of the five ways of transmitting a tradition discussed in class. For example, the presenter (or presenters) could demonstrate a traditional dance step so the class can observe it and then giveverbal instructions to the class on how to do the step. This part of Lesson 3 was focused on: 1) recognizing and understanding the basic ways folk traditions are passed on to succeeding generations; and 2) learning about the term "emerging traditions" and studying examples of these newer traditions. 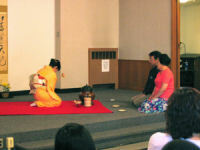 Student projects enabled students to get first-hand experience in passing on a tradition. The activity included definitions, examples, and questions to generate class discussion. Name and discuss five basic ways folk traditions are passed to others? Research and prepare instructions for teaching a new or old Nebraska folk tradition? (8.1.3) By the end of the eighth grade, students will identify and classify different types of text. (8.4.3) By the end of eighth grade, students will develop skills in discussion, debate, and persuasive writing by analyzing historical situations and events. (12.8.1) Essential Learnings 8. Students use the visual and performing arts to solve problems. A series of audio excerpts from an interview with Ms. Blakney, master Santee Sioux star quilt maker, and her student Virginia Thomas in Santee Nebraska, 1993. Interviewed by Gwen Meister. Excerpt of audio Interview with saddlemaker Dennis Rose in his shop, the Rose Saddlery, in Arthur Nebraska. Mr. Rose had been making saddles and doing other leatherwork since 1976. Interviewed by Gwen Meister. A feature piece on Mr. White, from Macy, Nebraska, who is an elder of the Omaha Tribe and a keeper of traditional songs. Excerpt of audio Interview with saddlemaker Dennis Rose in his shop, the Rose Saddlery, in Arthur Nebraska. Mr. Rose had been making saddles and doing other leather work since 1976. Interviewed by Gwen Meister.